Once your webinar has concluded, AnyMeeting provides you with a link, and download option, so you can upload the video to a desired destination (your website, YouTube channel, etc.) and start directing folks to your content via blog entry or social media post. AnyMeeting also provides settings to enable your recordings to be password protected, if that suits your needs. This video content can be easily repurposed for multiple promotions or training sessions. Ready to build a whole library of content and create a valuable resource for employees, customers or prospects? Just press “Start Recording” and AnyMeeting does all of the work for you. For more information about AnyMeeting’s free webinar service, visit www.anymeeting.com. Generate quality leads: Webinars are a smart tool when it comes to lead generation, but do you realize the quality of leads you are achieving? Your webinar attendees have registered for your event because they are interested in what you have to offer, and in addition, they are providing contact information, demographic information, and are committing their valuable time to listen and learn from YOU! With proper follow-up, these valuable attendees ultimately become paying customers! Great content marketing strategy: With content marketing trends shifting to more interactive and visual materials, webinars and webinar recordings are an ingenious way to distribute your valuable content. According to a recent report from Content Marketing Institute, B2B Content Marketing 2016: Benchmarks, Budgets, and Trends – North America, 66% of B2B marketers said that webinars are one of the most effective tactics for content marketing; 62% said videos (like your webinar recordings!) are most effective in content creation and distribution. Establishes you as an “expert” and “thought leader”: When your name and brand are attached to a successful and informative webinar, you are the expert. Once word gets out that your webinars are worth attending, and that you are a credible leader in your industry, attendees will flock, leads will spawn, and business will flourish. It’s that simple. Helps you practice public speaking: Bright lights and live audiences can be exceptionally daunting when you haven’t done it much, but webinars can be a stepping stone towards being a great public speaker. Getting comfortable speaking to your online audience from the comfort of your office will help build up your confidence — especially when you start seeing all the positive feedback filling the online text chat! The more you do it, the more of a guru will become, and public speaking engagements will become much less intimidating. Partnership opportunities: Bringing in partners as “guest hosts” is a strategic way to build stronger business relationships, expand your customer-base, and bring fresh content to your audience. Not only will you keep things fresh, but you will ultimately maximize your brand’s exposure by broadcasting your webinar to a wider audience, and generate new leads. Helps you hone-in your message: As a business leader, you want to make sure that when you speak to prospects, your message resonates and enforces your value proposition and market position. When you do this on a regular basis, you will get better and better, figuring out what works and what doesn’t. In addition, be sure to survey attendees after each webinar, and include questions that will help you assess if your presentation was effective in relaying your message. Incorporate this feedback and with each new webinar, you will further refine the message that resonates with your customers. Ready to plan some killer webinars? AnyMeeting is ready to help! 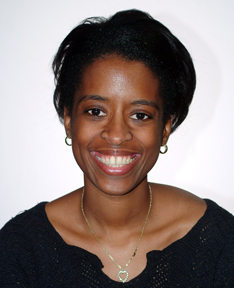 Embracing the summer heat, AnyMeeting continued its popular “Small Business Toolkit” webinar series with its latest guest webinar from Heather Butts, founder of L.E.A.R.N for Life Consulting. 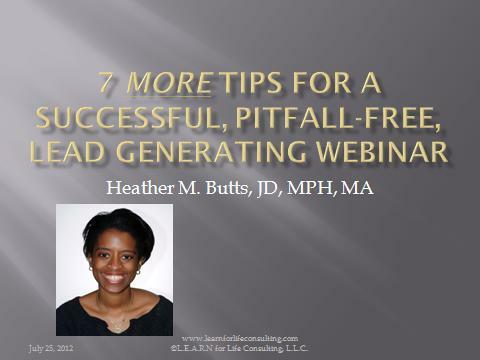 A professional webinar consultant and frequent user of AnyMeeting, we would like to thank Heather for presenting “7 More Tips for a Successful, Pitfall-Free, Lead Generating Webinar,” which expanded on her previous webinar in May. We’d also like to thank the more than 140 attendees who participated with great questions and comments. Heather’s webinar provided more valuable insight on pitfalls to avoid and tips to ensure a successful webinar that generates leads. If you were not able to attend live and would like to view the recording, just click: Recorded Webinar to Generate Leads. Join us on Wednesday, July 25th at 11 a.m. Pacific for the next free webinar in our “Small Business Toolkit,” webinar series and get more helpful tips to ensure a successful webinar. 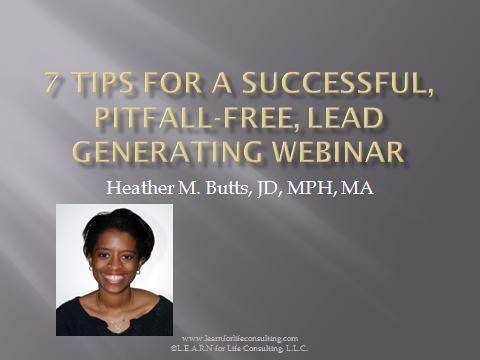 Professional webinar consultant Heather Butts will expand on her previous webinar from May 1st to provide additional guidance on the proper steps to take, and pitfalls to avoid when putting together a solid webinar that generates leads. Additionally, Heather will offer all registrants a free report entitled, “Webinar Best Practices.” She will also provide 10 participants with a free 30 minute consultation on their next webinar. Only 200 spots are available – so sign up today for free. Make sure you log in to the webinar early – attendance is on a first-come, first-served basis. A recording of the webinar will also be made available. We’d also like to thank the more than 200 attendees who participated with great questions and comments. Heather’s webinar provided great insight on pitfalls to avoid and tips to ensure a successful webinar that generates leads. If you were not able to attend live and would like to view the recording, just click: Recorded Webinar to Generate Leads.